Since its opening, The Wizard of Oz film has captured the hearts and imaginations of millions of viewers. In Follow the YELLOW BRICK ROAD, all of the great Wizard of Oz characters are captured as their journey begins down the fabulous Yellow Brick Road. Glinda the Good Witch looks on as the Munchkins merrily celebrate their newly gained freedom from the Wicked Witch of the East whose demise came from a falling house. Above "Munchkinland", the Professor Marvel balloon floats towards the Emerald City while Dorothy, Scarecrow, Tin Man and Cowardly Lion begin their adventure. And, of course, the Wicked Witch of the West looks on, watching their progress and hoping for an opportunity to capture the fabled Ruby Slippers. 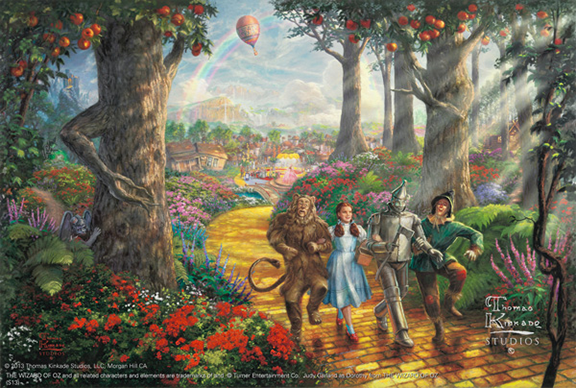 The color and Beauty of the Land of Oz have been elaborated in this masterwork using Thomas Kinkade Studios' signature romantic luminist style. Gorgeous flower beds line the Yellow Brick Road and the mountains in the distance are glowing with the warmth of the passing day. The dappling of light on the ground appears from the shadows as the sun bursts through the foliage of the trees. Dimension emerges and the image comes to life with these artistic effects. Join with Thomas Kinkade Studios and all those who love the fantasy of The Wizard of Oz in celebration of this exciting release. Come to the gallery today to see this exciting new release from the Thomas Kinkade Studios! We have wonderful things in store for you! The edition is expected to sell out and demand is high so reserve yours today! Click on the studios logo above to listen to Thomas Kinkade talk about his vision for the Thomas Kinkade Studios and what inspired him to mentor this talented group of artists.